Please complete the form to download the eBook. There are currently a half-dozen different insulin analogues on the market. These differ from each other and from natural insulin by just a few amino acids, but exhibit markedly different pharmacokinetic and pharmacodynamic properties. Liquid chromatography and mass spectrometry (LC-MS) offers a powerful tool for the sensitive and quantitative detection and discrimination of these highly similar recombinant proteins. 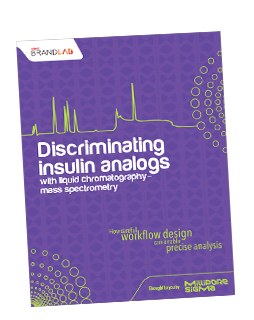 This whitepaper reviews the considerations that analytical chemists should take into account when planning to undertake LC-MS analysis of an insulin analogue-containing specimen.